Paul and Lynn Burks and Larry and Rita Bennett recently presented the Rev. Monica Villarreal (left), of Salem Lutheran Church in Flint, Michigan, a check for $2,002.77 and 10 cases of bottled water. The children of Upper Sandusky’s First Lutheran Church collected coins during Lent for Salem Lutheran Church, which needs to replace its plumbing infrastructure because of corrosive pipes and lead in the water. A pair of Upper Sandusky couples recently traveled to Flint, Michigan, to deliver 10 cases of bottled water and more than $2,000 to Salem Lutheran Church. Paul and Lynn Burks and Larry and Rita Bennett traveled to the Flint, Michigan, church on behalf of the congregation of First Lutheran Church in Upper Sandusky. 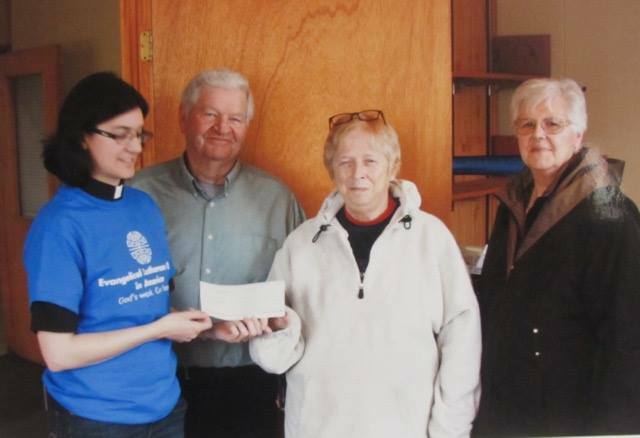 The youth in the local church congregation raised $2,002.77 by collecting coins during Lent to be donated to Salem Lutheran Church, which needs to replace its plumbing infrastructure because of corrosive pipes and lead in the water. That item was a bottle of water drawn from a non-filtered faucet at the church. “Sediment is quite obvious,” Rita Bennett said. The couples traveled to Flint on a Thursday, the start of water pick-up days at the church. Rita Bennett said 20 pallets of bottled water are delivered to the church on those days, with free pick-up of unlimited cases from around 9 a.m. to 3 p.m. The Burkses and Bennetts observed corroded galvanized plumbing that had been removed from near the church’s boiler system, and the estimate for replacing the damaged church’s plumbing, sinks, faucets and bathrooms is around $30,000. The church needs an additional $32,000 for asbestos removal prior to replacement of the plumbing, Rita Bennett said. Flint, located 70 miles north of Detroit, is a city of 99,002, where 41 percent of residents live below the poverty line and the median household income is $24,979, according to the U.S. Census Bureau. The city once thrived as the home of the nation’s largest General Motors plant, but its economic decline began during the 1980s when GM downsized its industrial complex. The city switched water sources in 2014, and while a new pipeline connecting Flint with Lake Huron was under construction, the city turned to the Flint River as a water source during a two-year anticipated construction transition, Rita Bennett explained. Health effecfts of lead exposure in children include impaired cognition, behavioral disorders, hearing problems and delayed puberty. In pregnant women, lead is associated with reduced fetal growth, and in the entire population, lead consumption can impact a person’s heart, kidneys and nerves. Although there are medications that may reduce the amount of lead in the blood, treatments for the adverse health effects of lead have yet to be developed. Salem Lutheran Church is the only Evangelical Lutheran Church of America church in Flint. Villarreal was born and raised in Flint, and is considered a part-time pastor and part-time social worker. The church has a congregation of about 50 people each Sunday, the Bennetts and Burkses said. She noted Flint will deal with its lead crisis long after the media leaves the city.